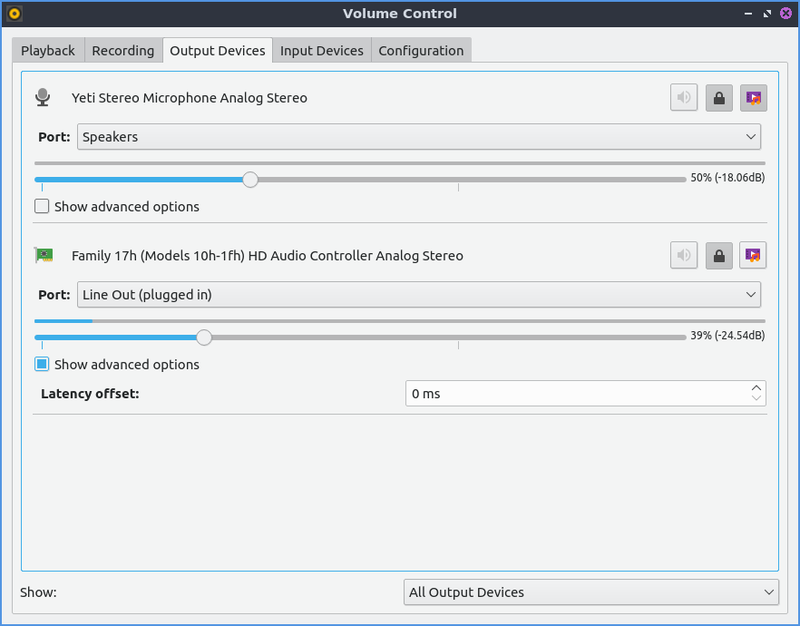 Pulse Audio volume control is the default volume mixer for Lubuntu. 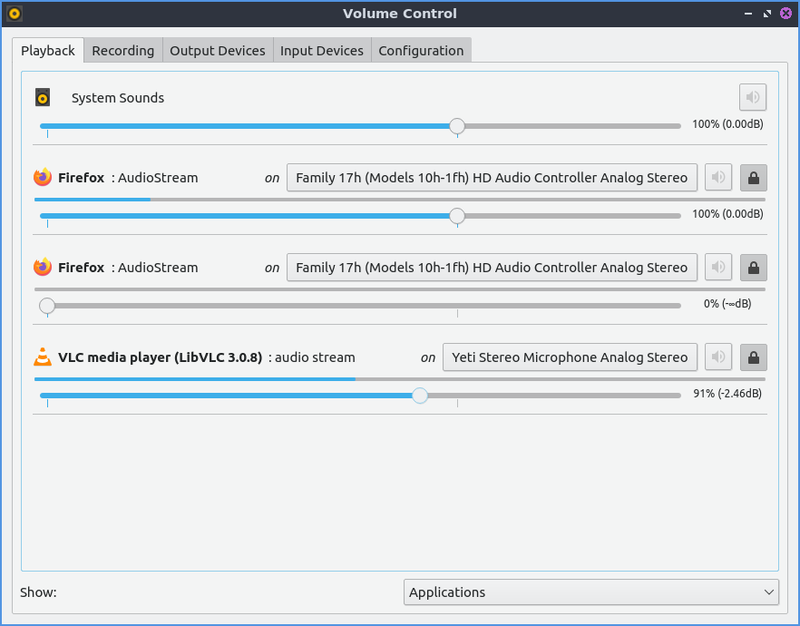 The Playback tab of pulseaudio volume control gives you the ability to the control the output device, mute, or change the volume of each application. To change the Volume of each application on the playback slide the slider to the right for more volume or to the left for less volume. The button with an X over the speaker is a mute button and if it is a darker gray that application is currently muted and can’t make any sound. The drop down menu has next to the word on shows the output source. This program also in software allows you to go over 100 percent if it is too quiet. The Output devices tab shows different output for different sounds. To mute one output such as a set of speakers press the button that looks like a speaker with an X on it. To increase the volume of an output slide the slider for that output to the right. To decrease the volume for each output slide the slider to the left. To view more advanced options check the Show advanced options will show advanced options. The advanced option for Latency offset will be shown for for how long to shift offset for latency for say a badly synced video. To the right of the mute button there is a button where you can change the balance between the left and right speakers by sliding the sliders just like for volume. For setereo setup with a subwoofer for example will have channels Front Left, Front Right, and Subwoofer each having there own channels to adjust volume. To select another source to output audio use the Port drop down menu. The Input devices tab manager your sound inputs. To mute your microphone in pulseaudio toggle the button that looks like a speaker. To adjust input volume slide the slider to the right to increase volume or to the left to decrease volume. To select which input such as line in or microphone for your device is in the Port drop down but this menu is hidden if you do not have inputs. The Configuration tab has different sound profiles for each different output device. To change The profile for each device change the Profile drop down menu. 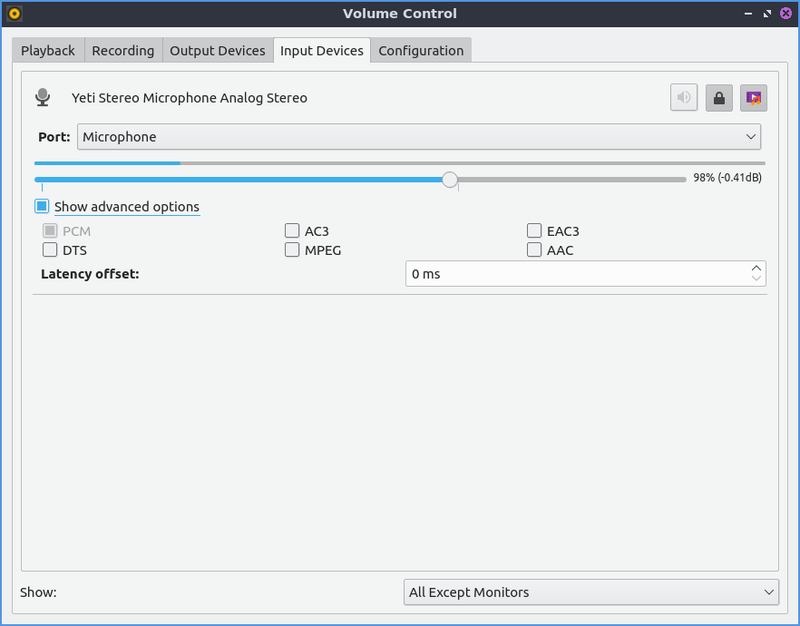 Lubuntu ships with version 0.4.0 Pulse Audio Volume Control. from the command line. Another way to launch Pulse audoio volume control is to left click on the volume applet in the panel and click the Mixer button.